1) They don't have the money to send you. International mission trips can be expensive. Someone has to pay for it, and sometimes parents feel that financial pressure. But if you want to go on that mission trip, you don't want your parents to feel that pressure. If your parents are left with the burden of financing your mission trip, they may be hesitant to let you go. You need to show your parents that you are willing to take charge of raising the money that you need to go. Tell them about your fundraising ideas. Create a fundraising plan that shows your parents that you're taking this seriously. If your parents know that they won't be stuck trying to figure out how to pay for your trip, they'll be more likely to let you go. 2) They don't think it's safe for you to go. Teach your parents about the country you'd be visiting. The more familiar your parents are with the country, the more comfortable they'll get with idea of you traveling there. Tell your parents about all of the successful mission trips that have happened before yours. Does your youth group or organization go to the same place every year? If so, that's a great place to start as you show your parents that the trips before yours have been safe. Have your trip leader talk to your parents about the safety precautions that the team takes. Your trip leader is probably very familiar with the country you're hoping to serve, and very up-do-date on safety precautions. 3) They don't think you're mature enough yet. If your parents don't think you're mature enough to go on a mission trip, you need to take the time to show them why you are. 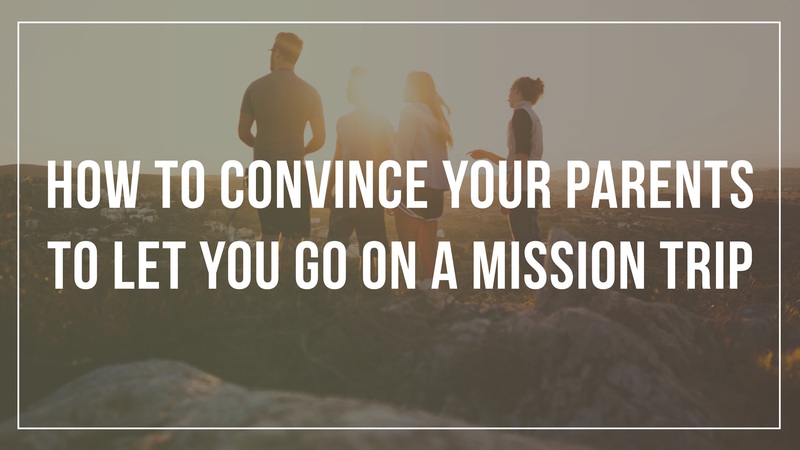 A good place to start is sharing with your parents why you want to go on a mission trip in the first place. What's motivating you? Your parents might think you only want to go on a mission trip to hang out with friends, travel, or get to know a cute guy or girl. Explain your true motives for going on the trip—which are hopefully to serve others, share God's love, and grow your faith. After you share with your parents why you think you're mature enough to go—by explaining your motivations for going—be sure to keep an eye on your actions. You want your words and your actions in sync. Hopefully these tips will help as you work to convince your parents to let you go on a mission trip. However, if your parents are still putting the brakes on your trip, remember that God is in control. Maybe your parents don't believe in God like you do, or maybe they just can't get past some of the safety concerns. No matter what their reason is, remember that God understands what you're going through. If God wants you to go, He will make the way. And if you don't get to go on this year's trip, trust that God has something else planned specifically for you in the future.